Available to let is this 4 bedroom home conveniently situated within walking distance of Esher main line railway station. Leading from the entrance hall with wood flooring is a front reception room with bay window, an additional large reception room/dining room leading to a modern shaker style galley kitchen, utility room and access to garage. To the first floor is the master bedroom with built in wardrobes, a single bedroom/study, further double bedroom and a small double bedroom. In addition is a family bathroom with separate wc. The rear garden is south facing with a decking area. Approximately 146 sq m ( 1570 sq ft ). Available to let unfurnished. Cobham 4 miles, Central London 22 miles, A3 21⁄2 miles, M25 (J10) 3 miles (Distances approximate). This property is marketed by Knight Frank - Lettings, Esher at £2,250 per month. Rightmove has calculated the price per week for comparison purposes only. Property reference 315920. The information displayed about this property comprises a property advertisement. Rightmove.co.uk makes no warranty as to the accuracy or completeness of the advertisement or any linked or associated information, and Rightmove has no control over the content. This property advertisement does not constitute property particulars. 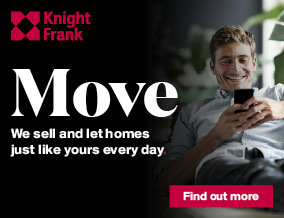 The information is provided and maintained by Knight Frank - Lettings, Esher.